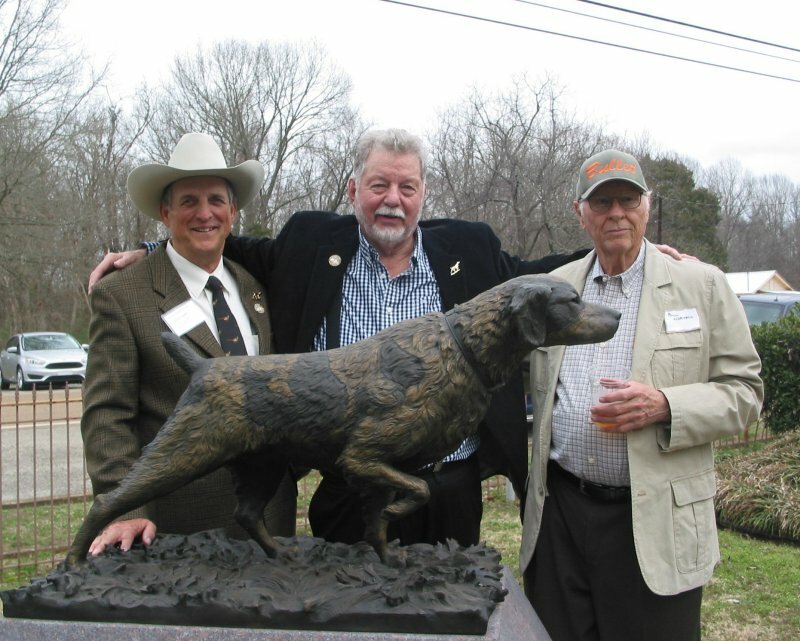 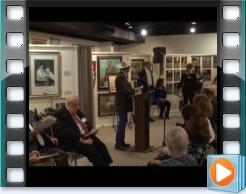 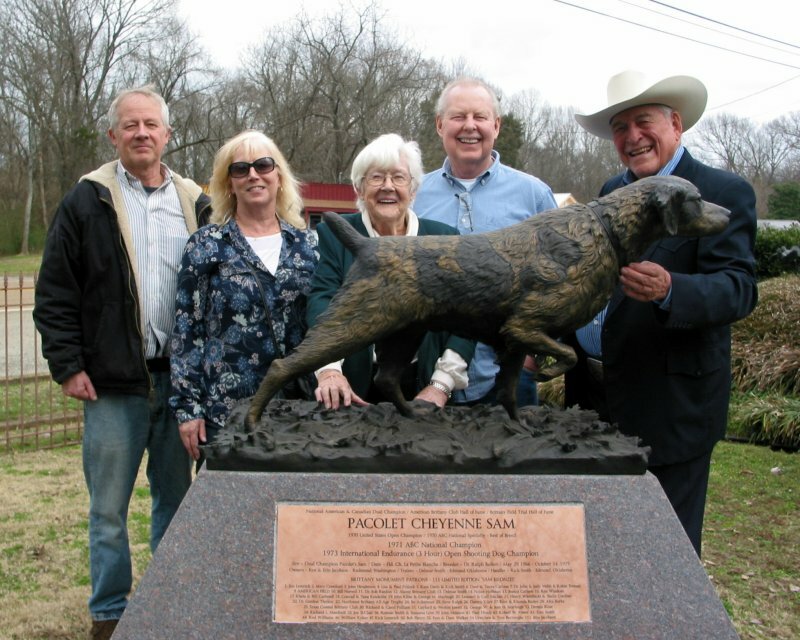 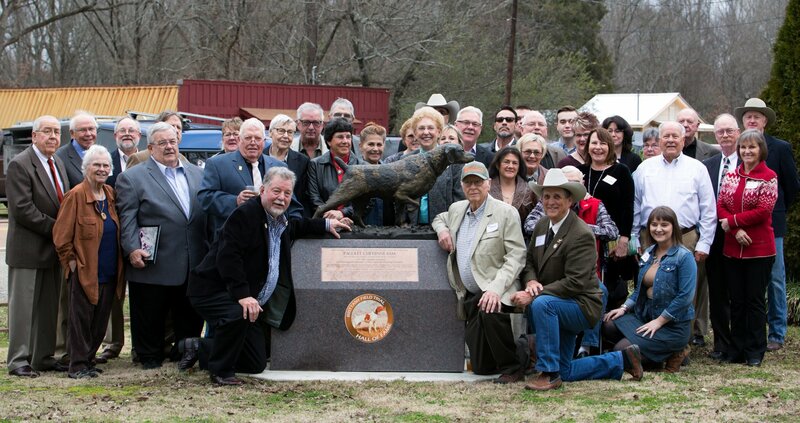 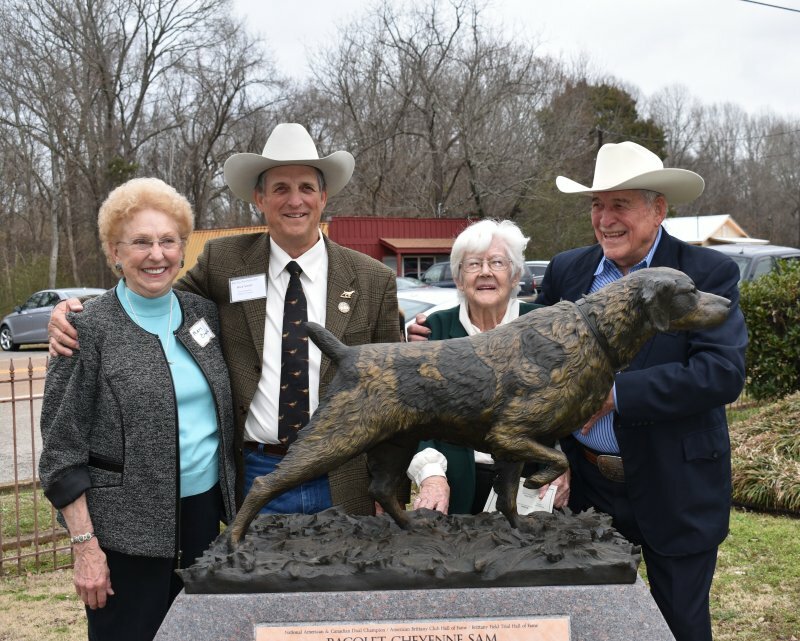 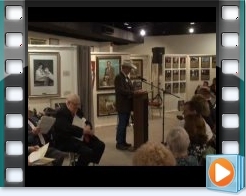 February 11 was a very special day at the National Bird Dog Museum. 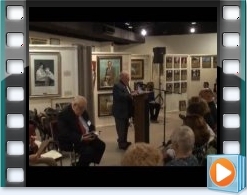 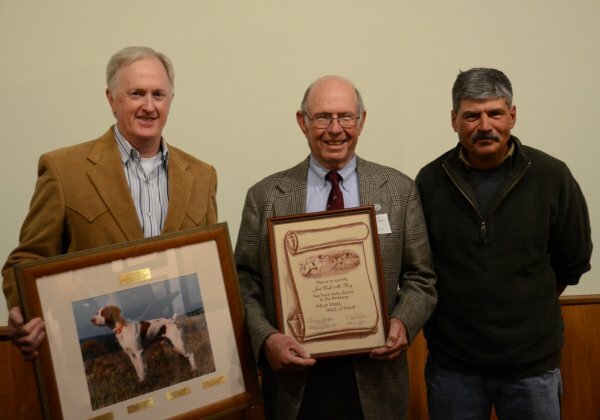 We inducted 3 hall of famers and presented 3 plaques, dedicated the Brittany Bronze statue on the grounds of the museum, remembered Bill Cartmell for his contributions to field trialing, the Brittany breed and the BFTHF, and added one of the original Iron Dogs and other memorabilia belonging to Alan Stuyvesant to our museum. 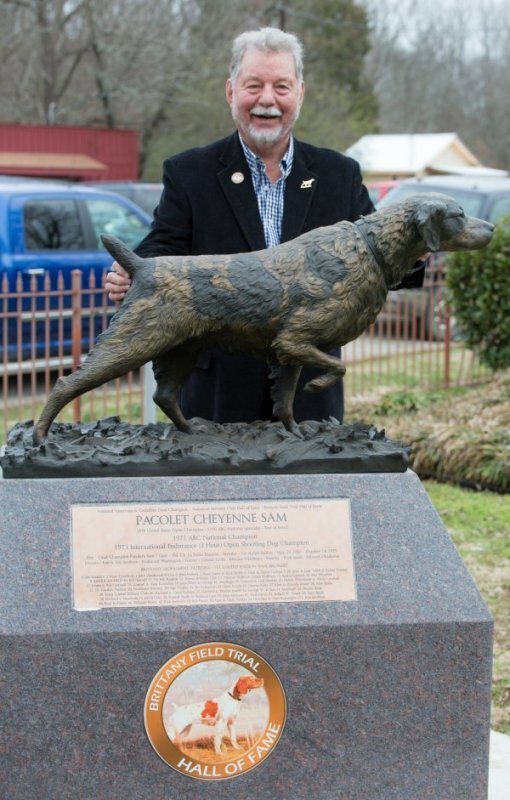 The life-size statue was designed and commissioned by Ken Jacobson and sculpted by renowned artist Matthew Gray Palmer. 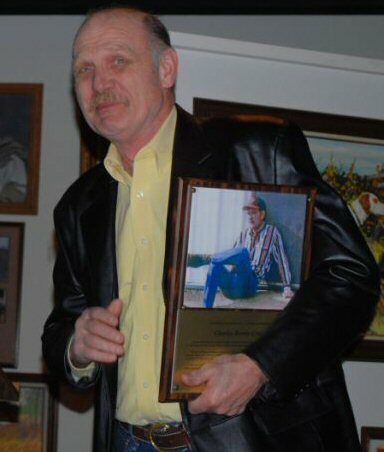 During the dedication, Ken spoke about his journey with Sam, Delmar and Rick Smith. 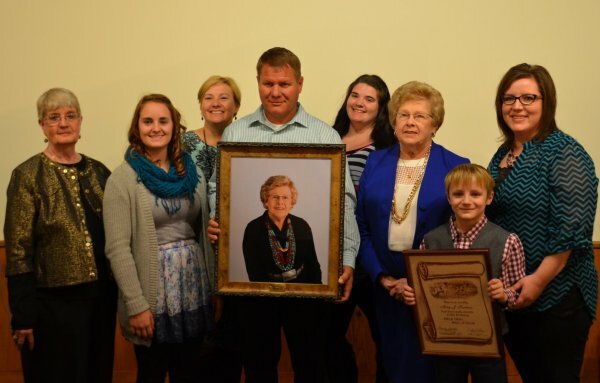 Brittany folks attending the inductions were all on hand to celebrate with Ken. 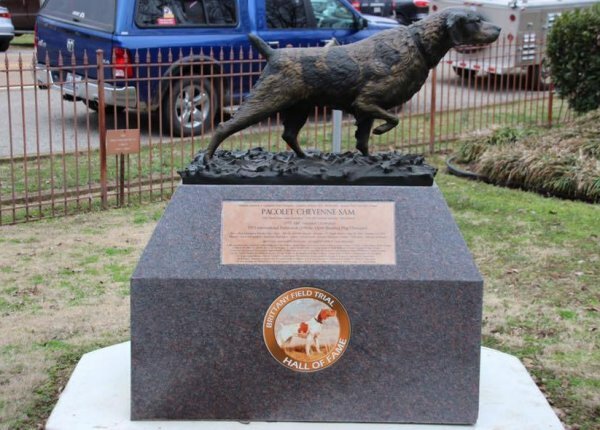 We finally have our breed represented in the museum gardens and are immensely thankful to Ken for taking on this monumental task. 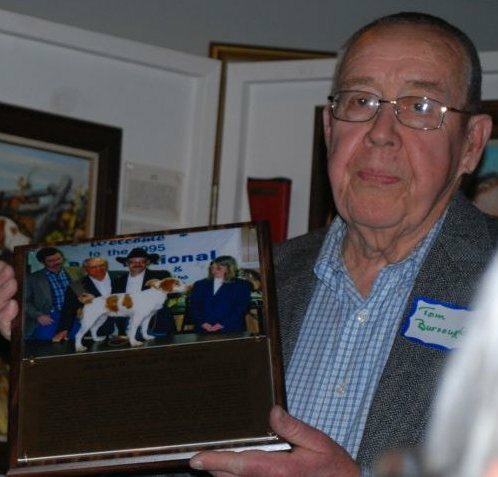 Bill Cartmell’s passing brought to mind the many contributions he made over his lifetime to field trialing and the Brittany. 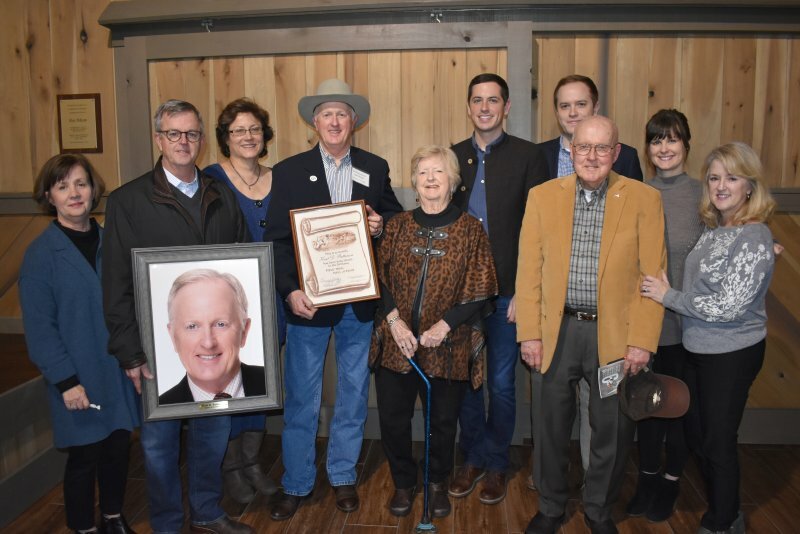 We were thrilled that Rheta, his “partner” in the many goals he pursued, was present with her daughter Patty and husband Tom Jeavons and her son Jim Cartmell. 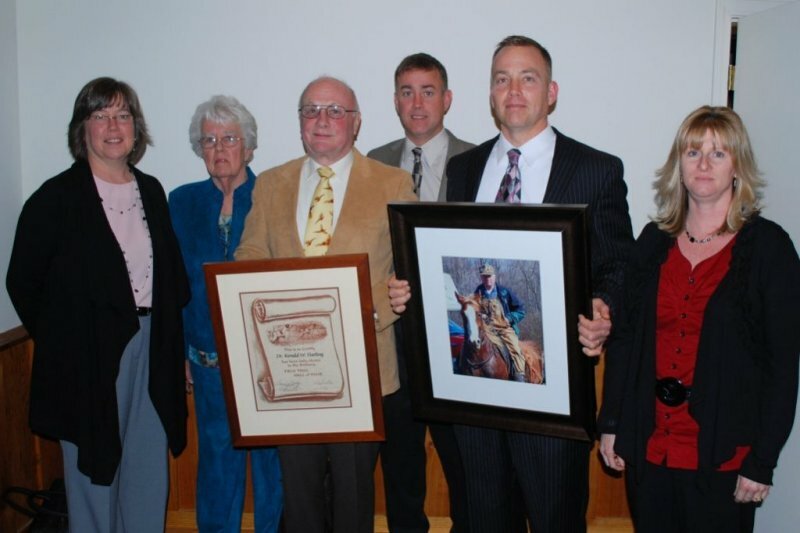 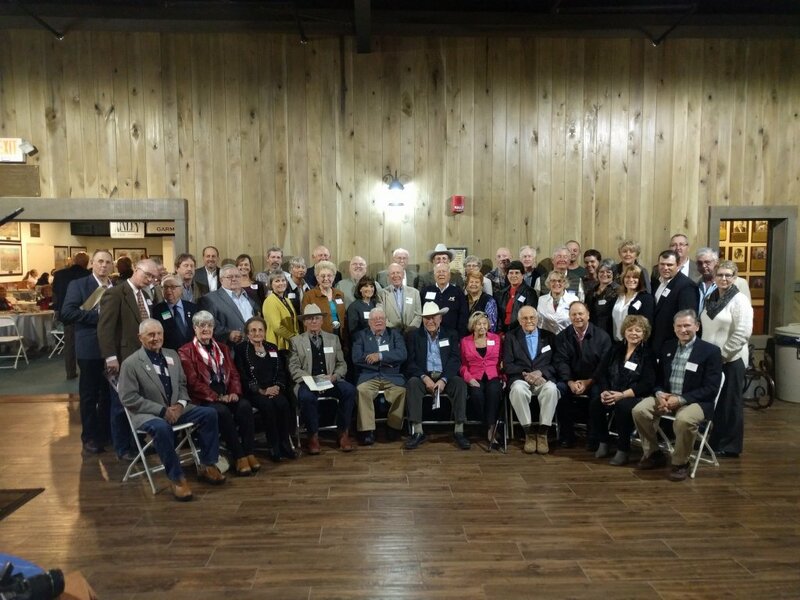 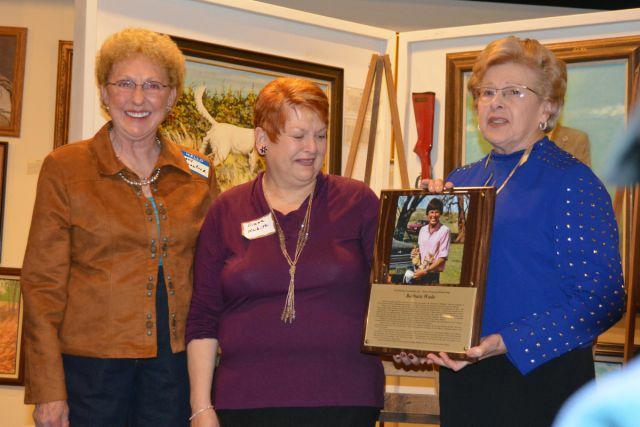 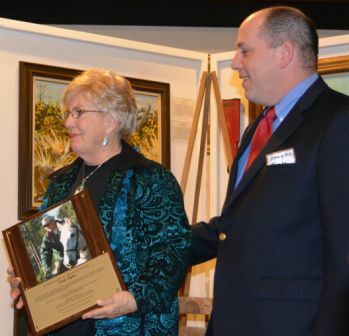 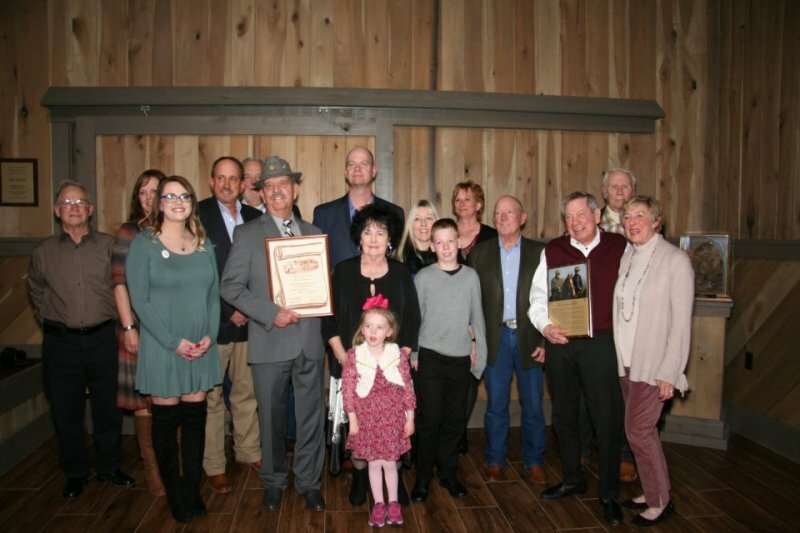 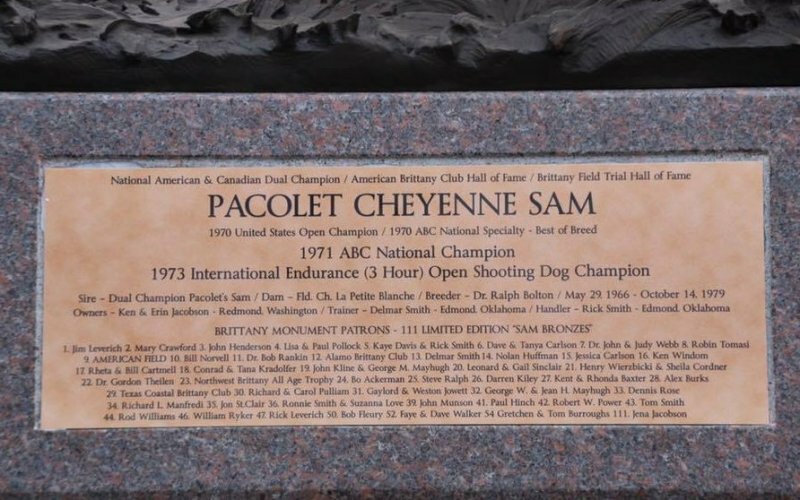 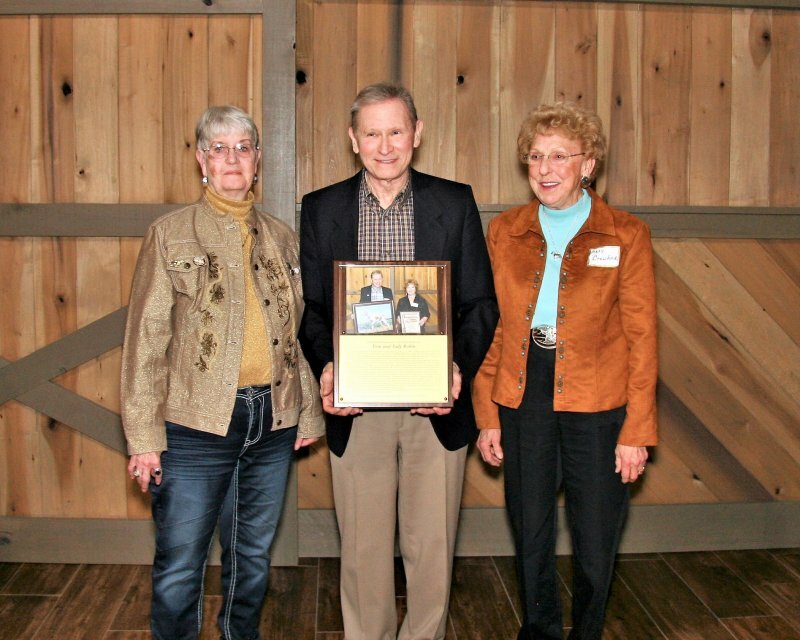 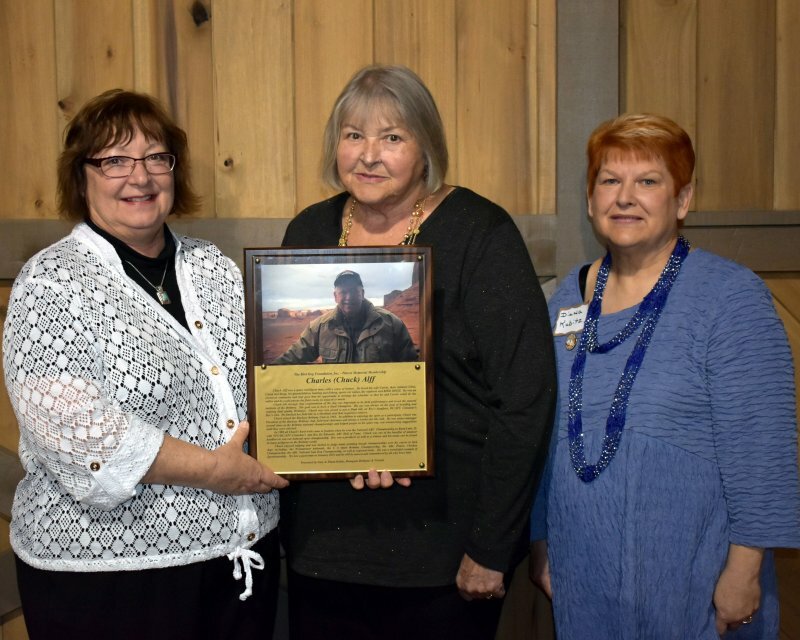 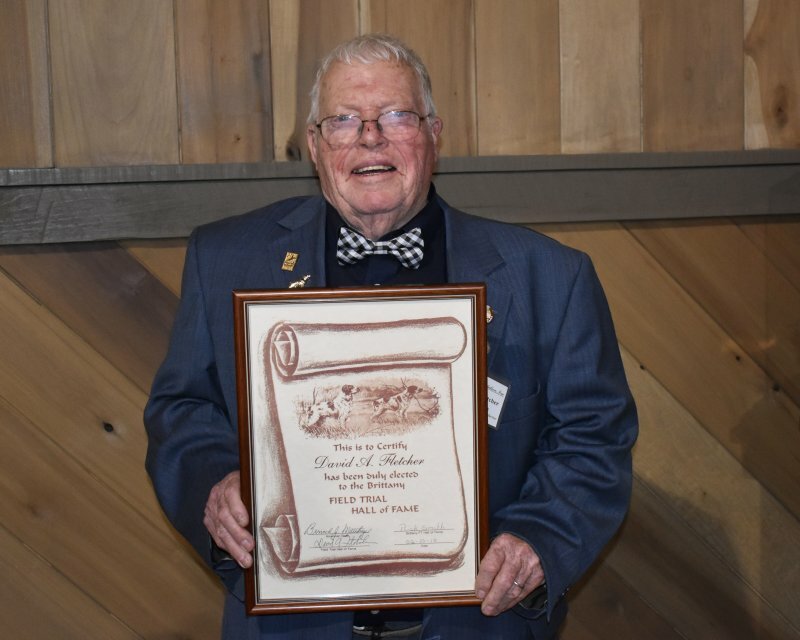 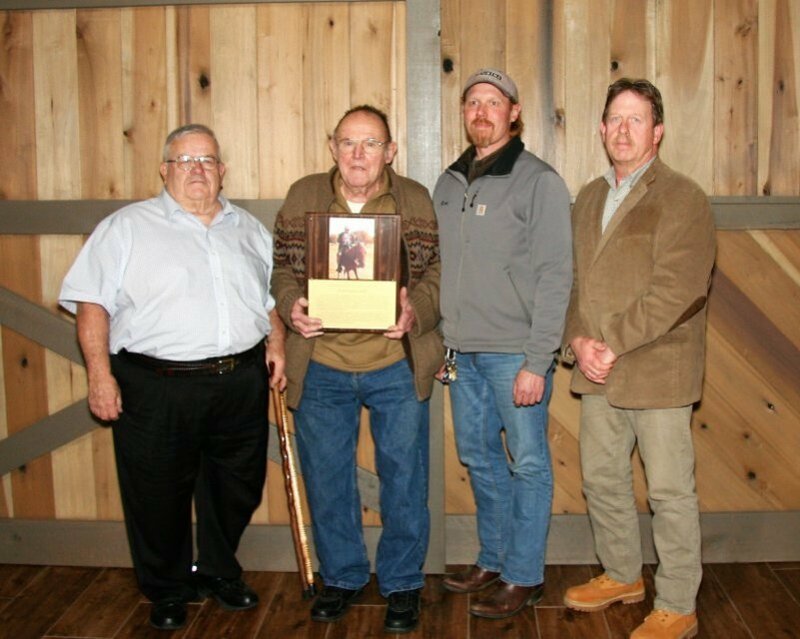 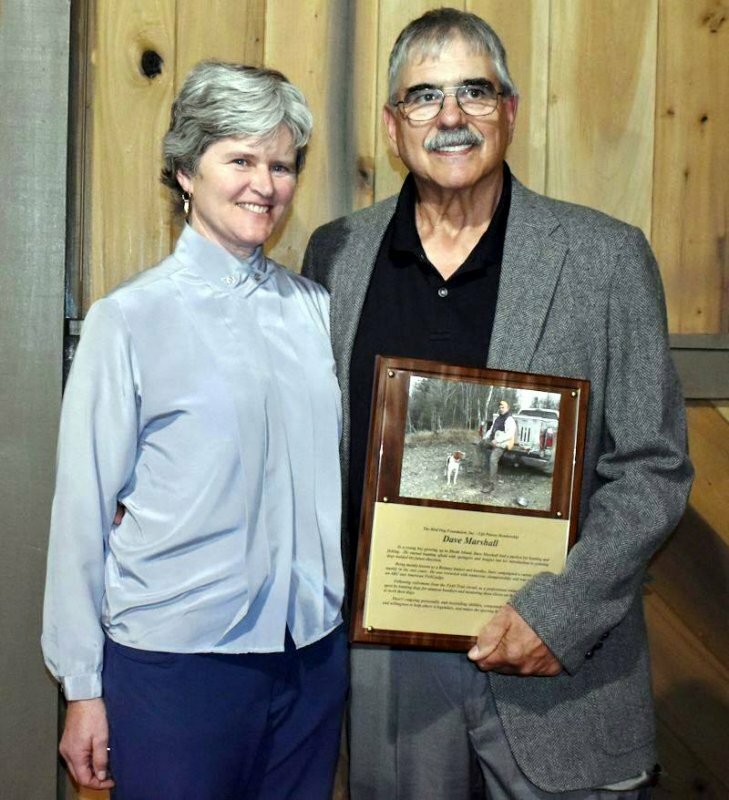 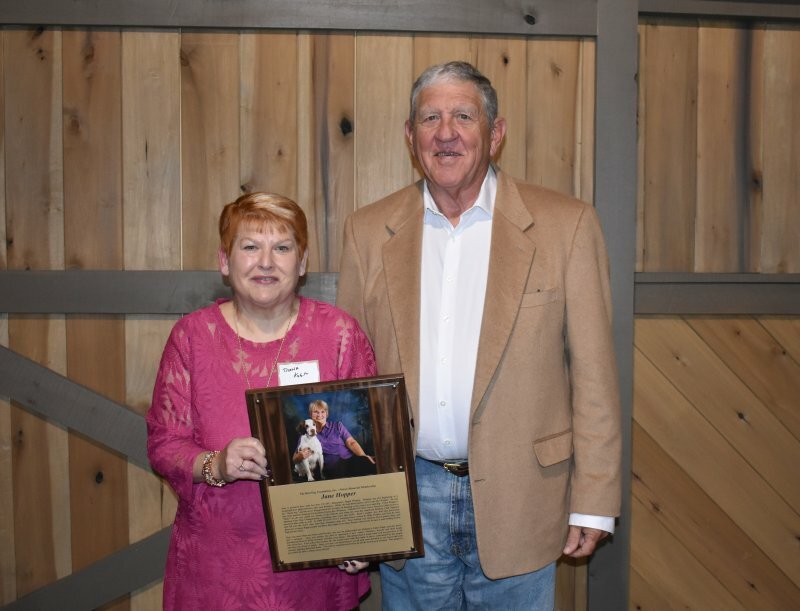 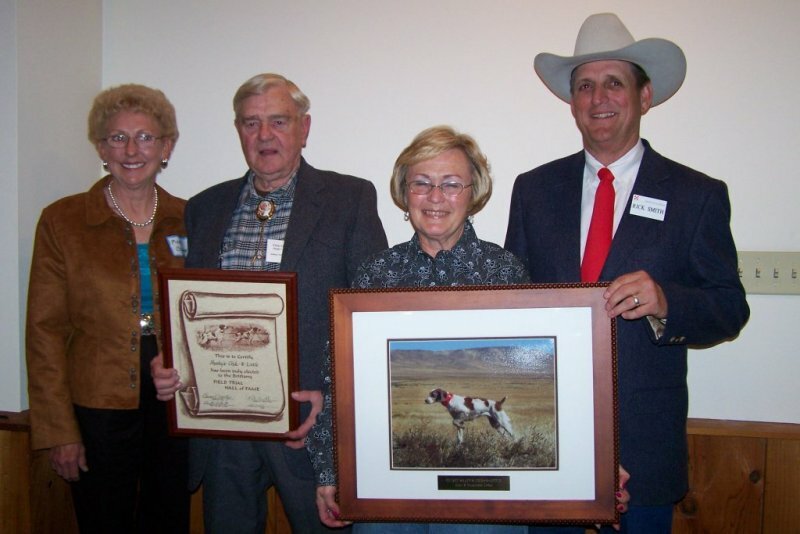 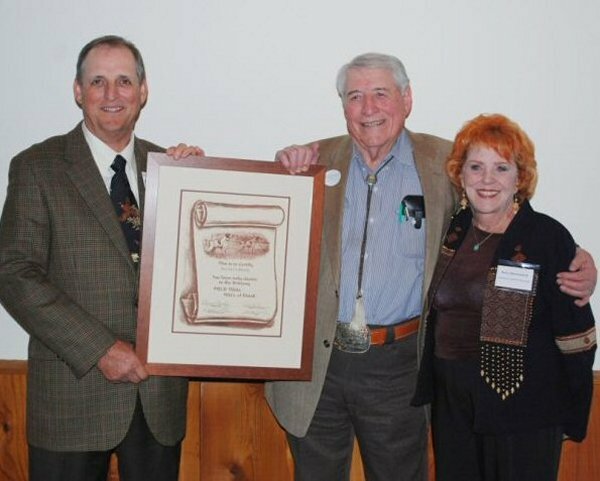 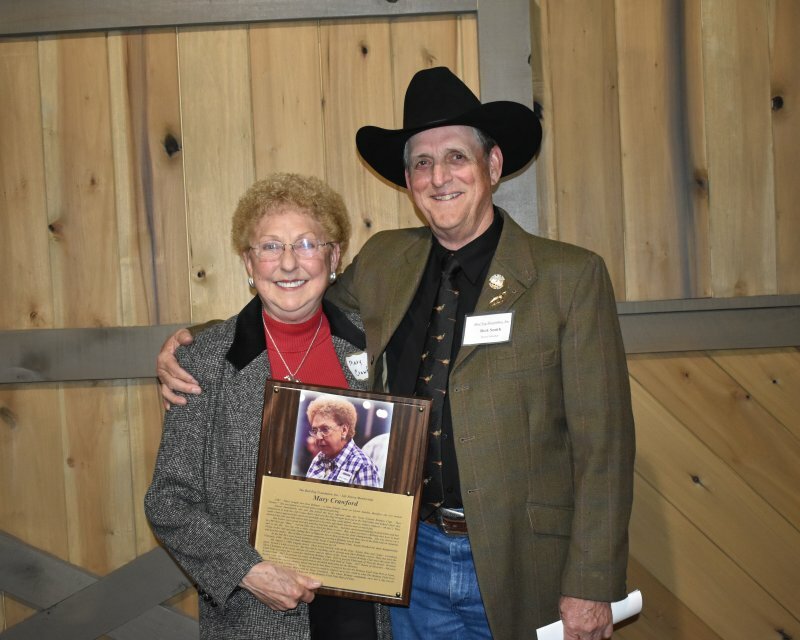 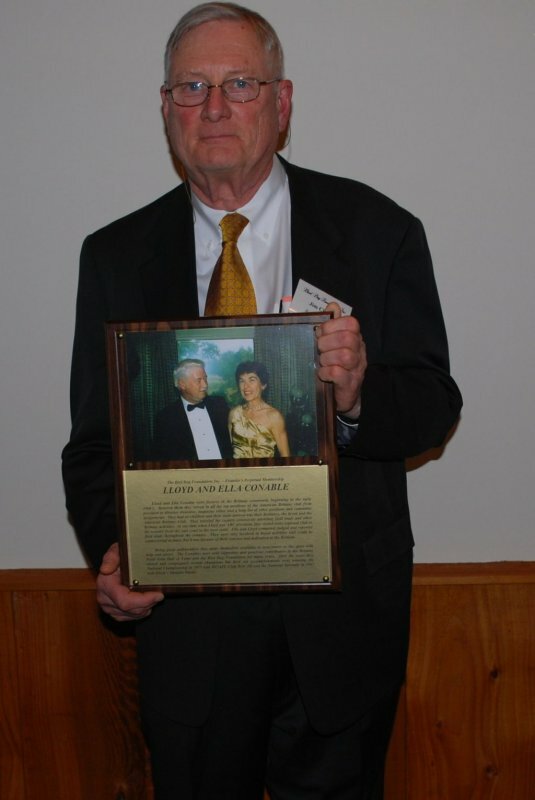 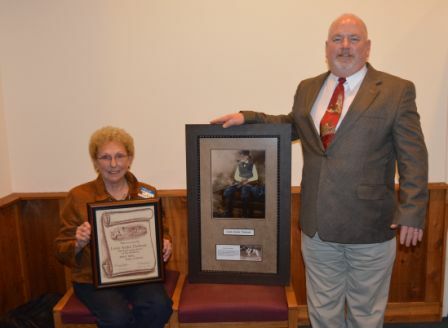 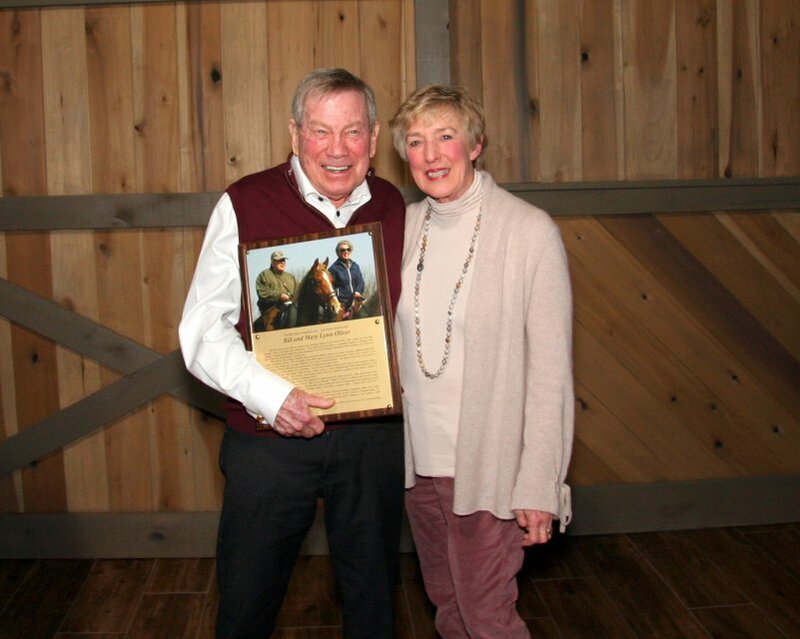 Bill was a driving force in making the Brittany Field Trial Hall of Fame a reality. 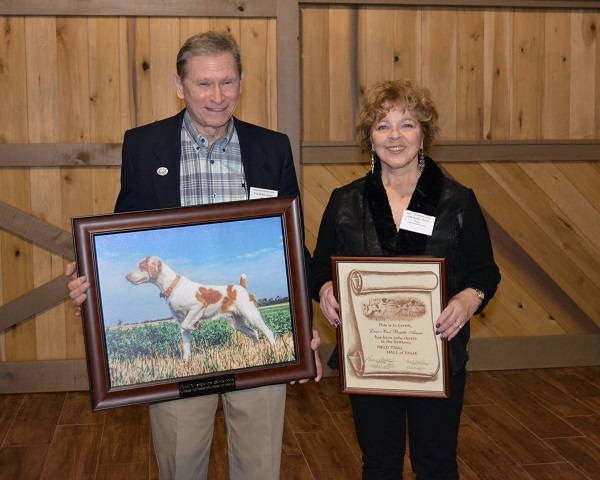 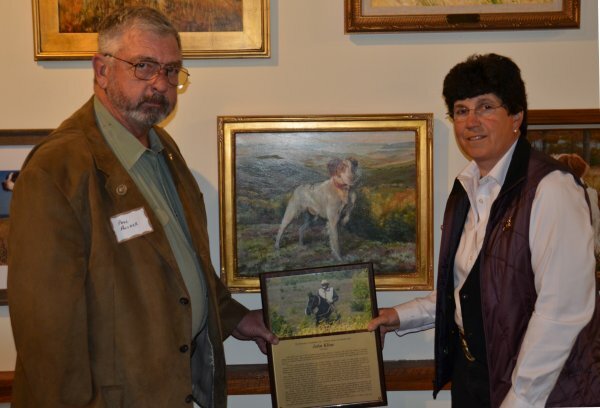 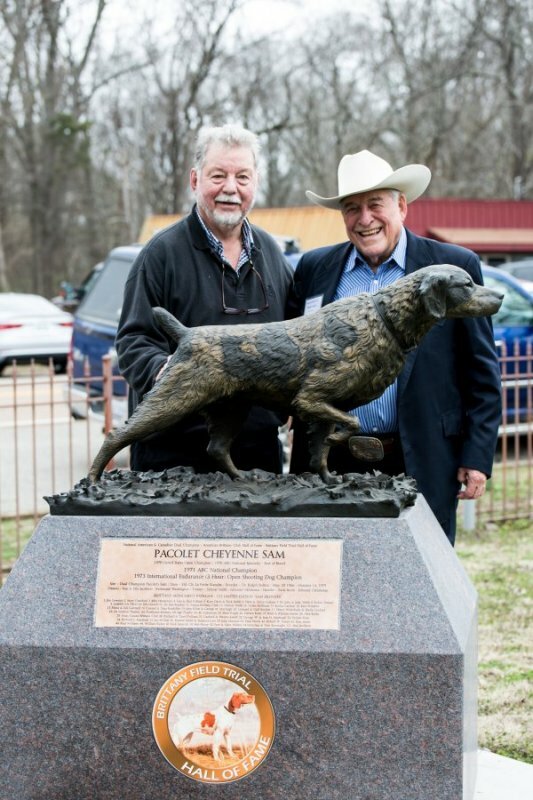 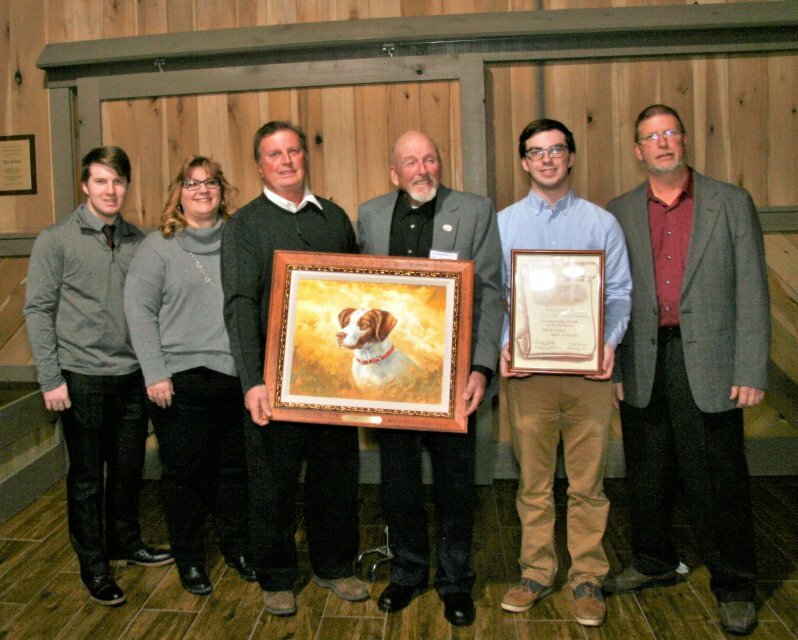 We honored Rheta during the ceremonies and remembered Bill for his influence in bettering the Brittany breed. 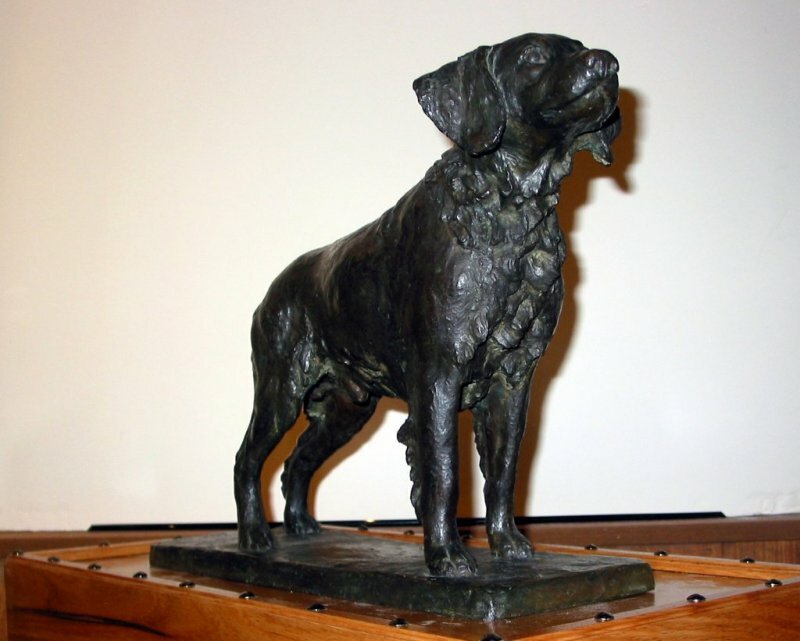 Through the generosity of Ms. Barbara Rokas, one of the original Iron Dog statues, commissioned by Alan R. Stuyvesant in 1952 and created by sculptor Richard Fath from France, is now on display in our museum. 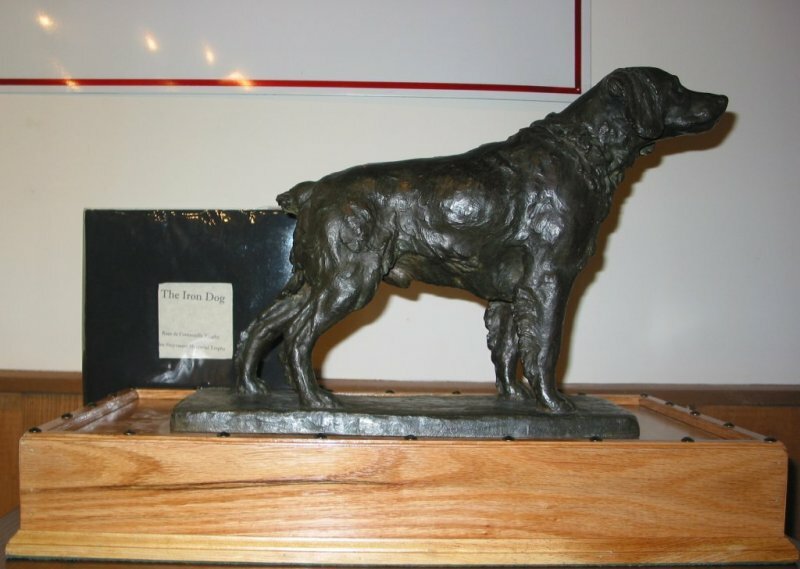 This statue, along with other items belonging to Mr. Stuyvesant, was brought to rest in our hall by Bob Fleury, a longtime friend of Ms. Rokas. 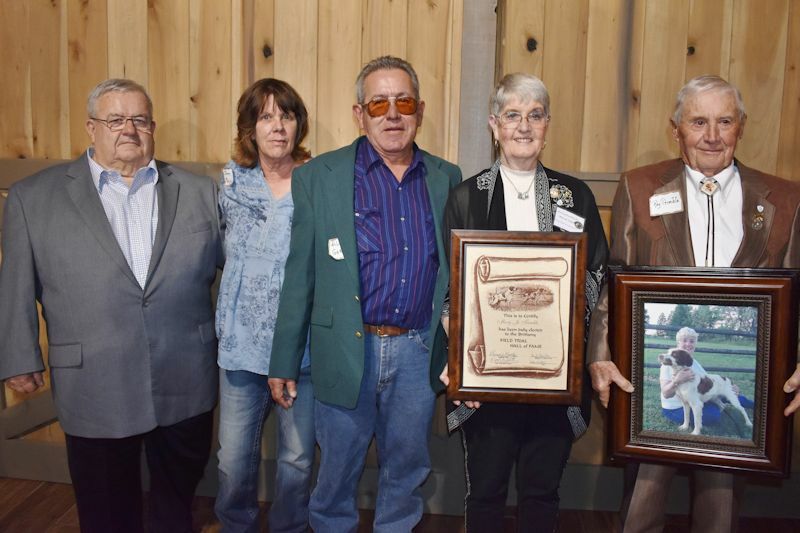 The Brittany Field Trial Hall of Fame is grateful to her for helping to preserve our heritage with memorabilia for our museum in the Brittany Hall. 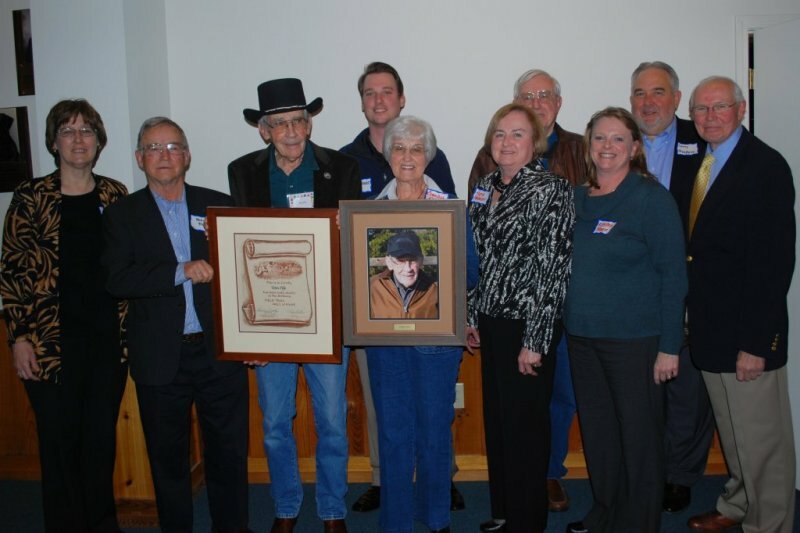 L to R: Mary Jo Trimble, Quinn Johnson, Kennie Davis, Steve Davis, Shane Mason, Mary Karbiner, Robert Karbiner & Gina Karbiner. 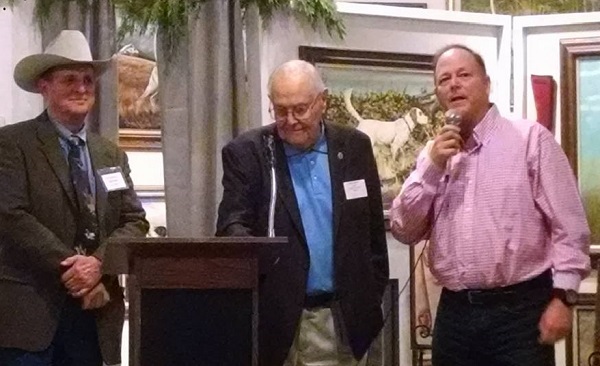 L to R: Kent Patterson, Tom Ettinger (holding scroll), & Ben Lorenson. 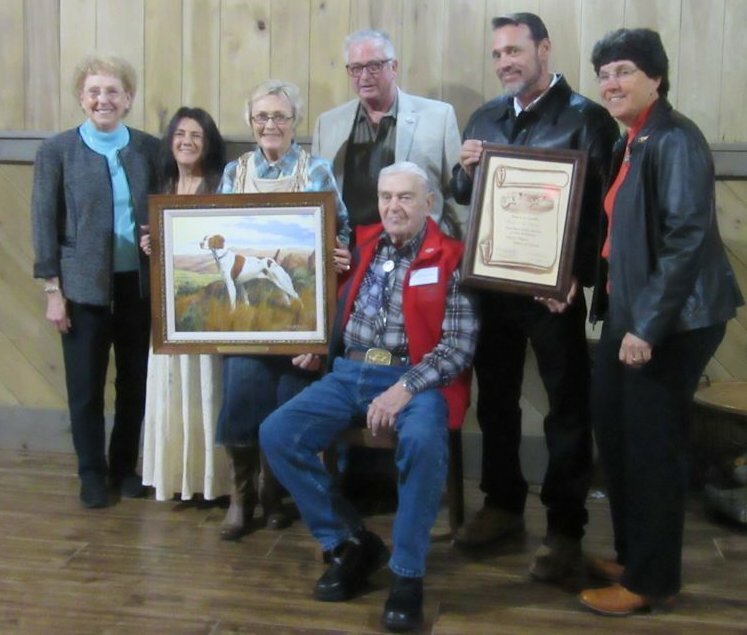 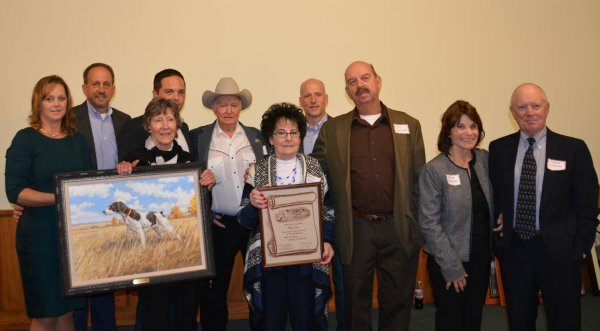 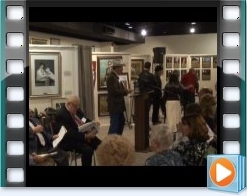 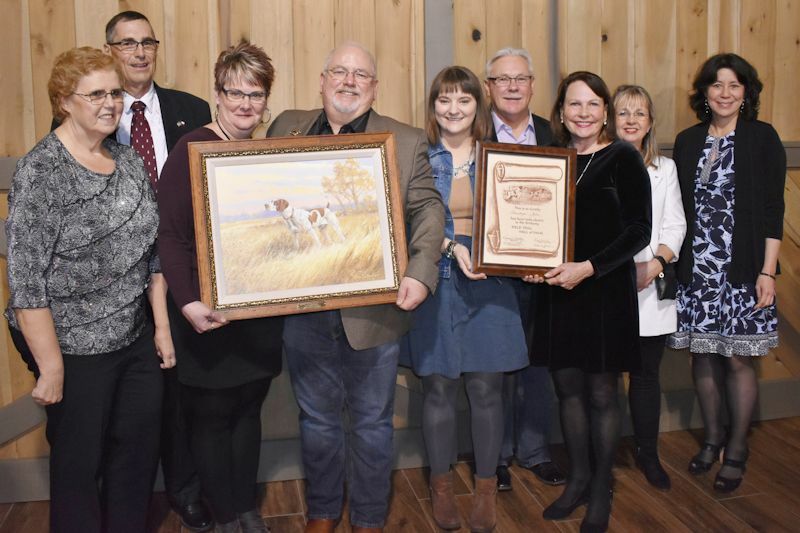 L to R: Harlene Gale Hoyt, Scott Johnson, Meam Floyd (holding painting), Justin Hagedorn, Francis Clasen, Marge Johnson, David Wheeler, Lyle Johnson, Joyce & David Lincoln..
L to R: Paul & Lisa Pollock. 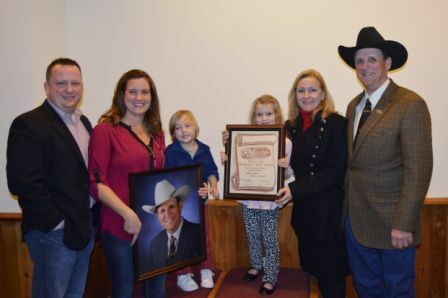 L to R: Matt Linch, Kristin Linch (daughter), Max Linch, Madilyn Linch, Kay Davis (wife), Rick Smith. 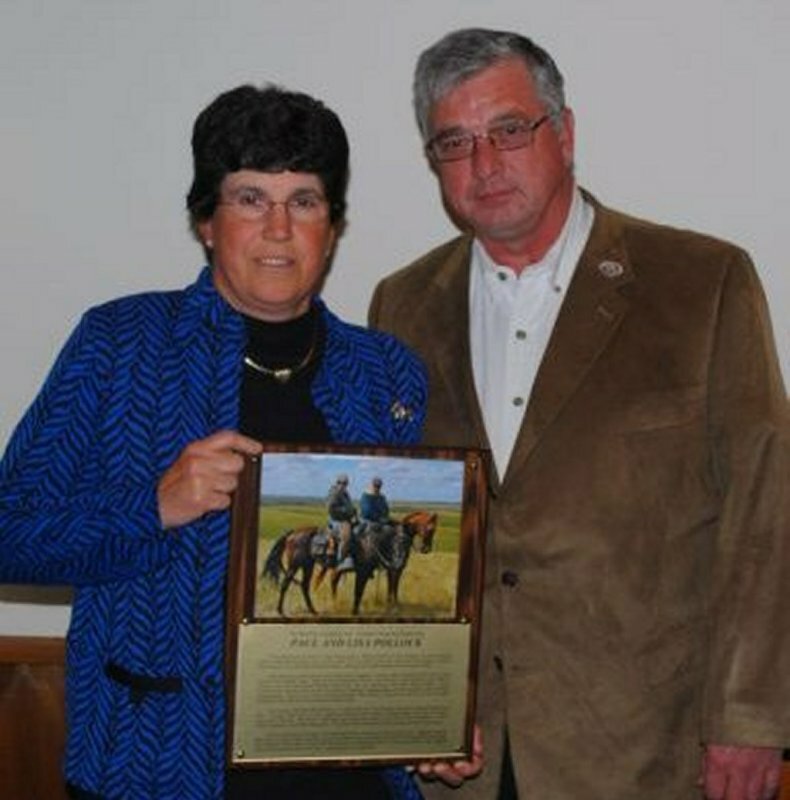 L to R: Mary Crawford & Steve Ralph. 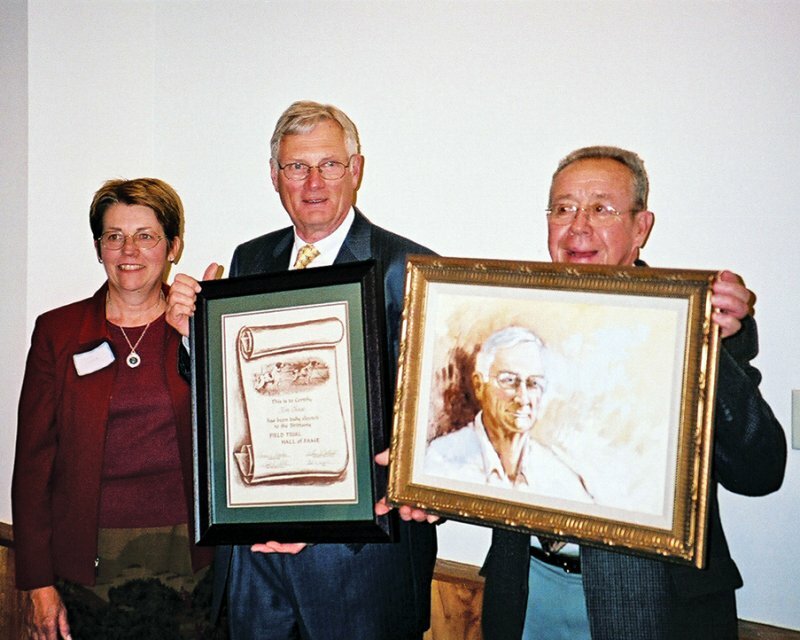 L to R: Mary Karbiner, Charles "Bernie" Crain, Bill Norvell. 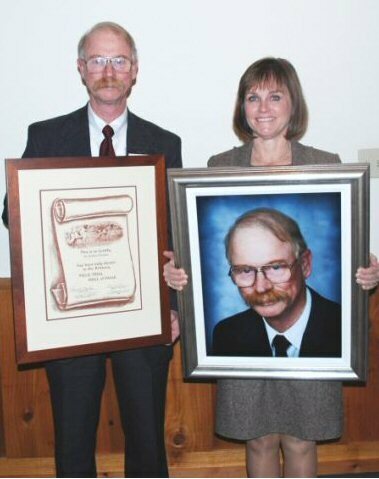 L to R: Venita Steele (wife) & Steve McClure. 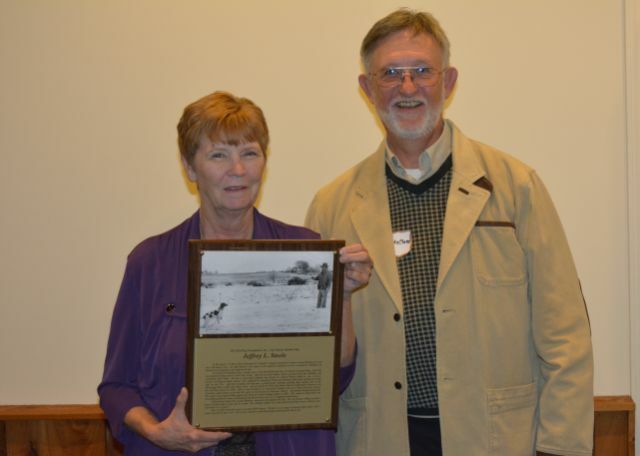 L to R: Judy Tighe (wife) & Douglas Tighe (son). 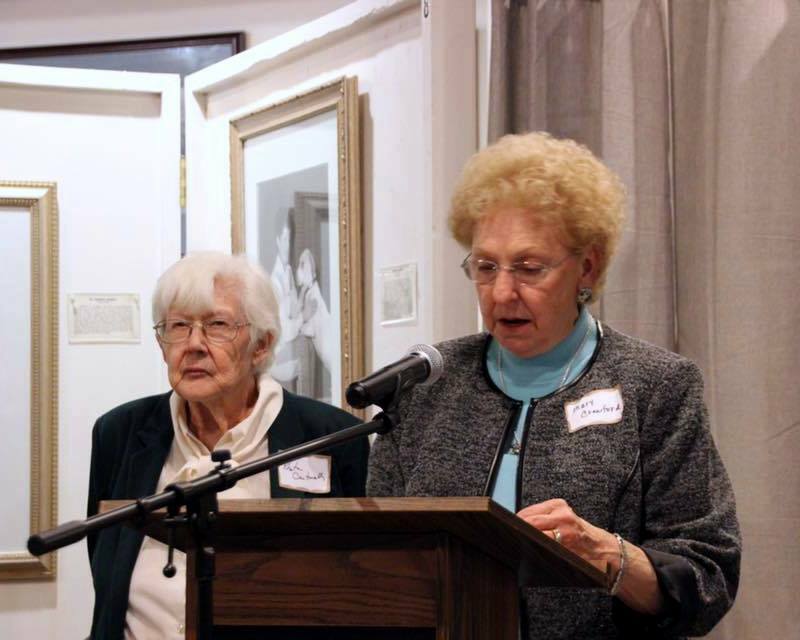 L to R: Mary Crawford, Diana Kubitz, Mary Karbiner. 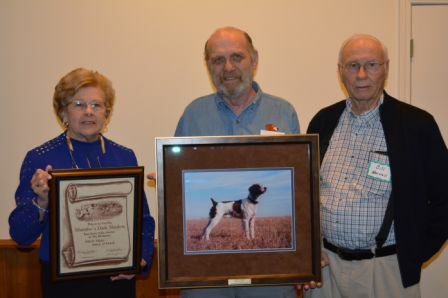 L to R: Rick Smith, Brenda Weak (sister) and Earl Weak. 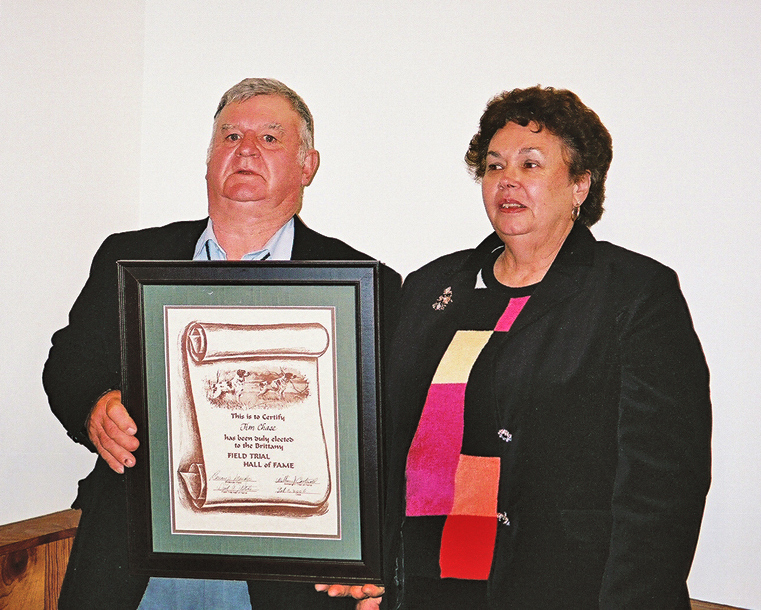 L to R: Julie Wright (sister) and Jim Wright. 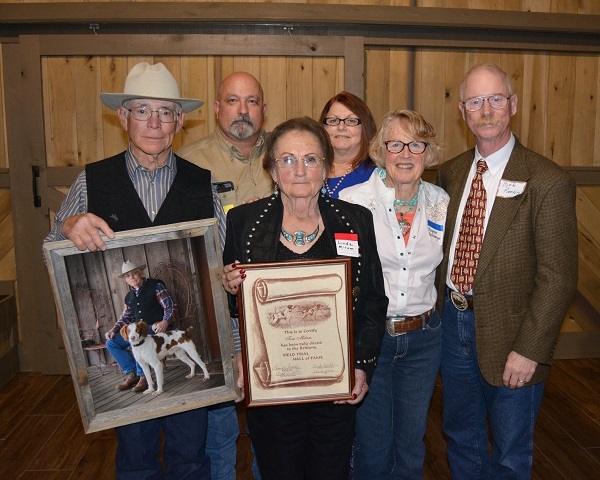 L to R: Mary Jo Trimble, Rick Smith, Brenda Weak (Janet's sister), Earl Weak and Julie Wright (Jim's sister). 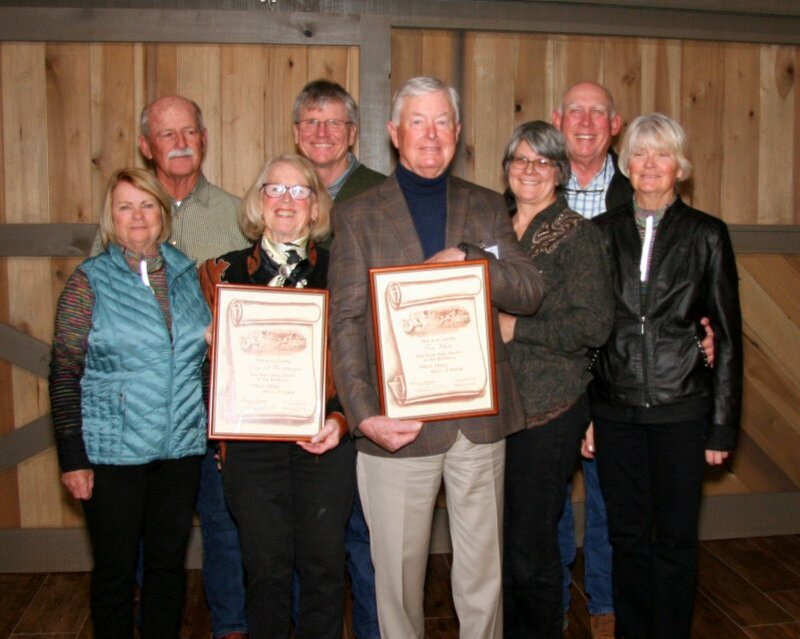 L to R: Cathy Kliewer, Herb Rea, Tom Fife, Tom Kliewer, Claudia Fife, Ruth Parman, Roger Fife, Kirsten Teague, Larry Hagedorn, and Bernie Matthys. 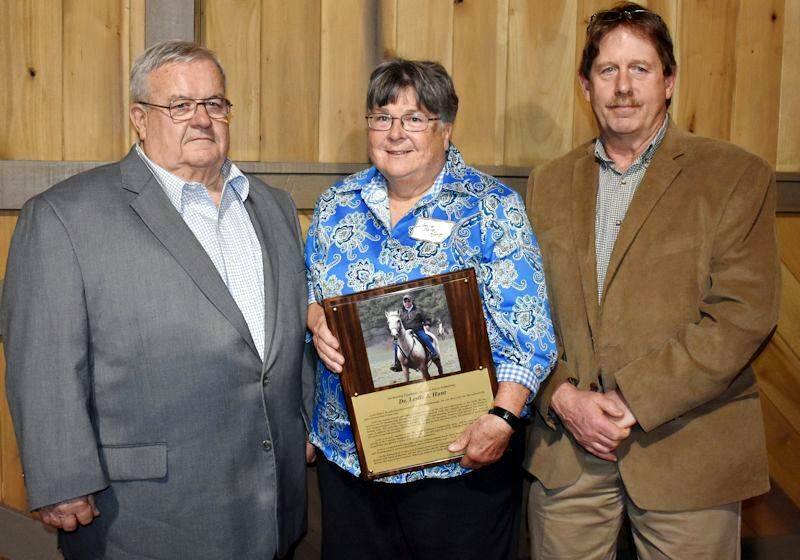 L to R: Carol Gallis, Sue Harling, Dr. Ron Harling, Sr., Stephen Harling, Ron Harling, Jr., Maggie Harling. 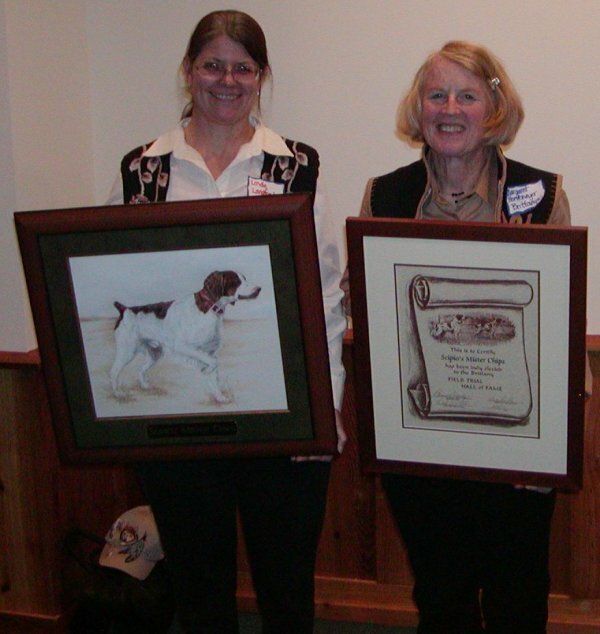 Accepting: Linda Langford & Margaret Horstmeyer. 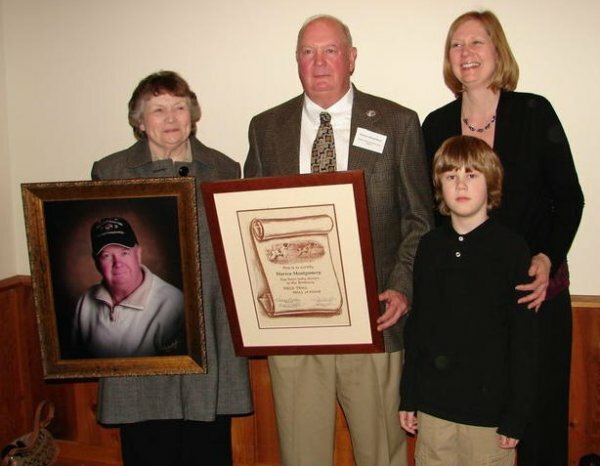 L to R: wife Carol Mongomery, Warren Montgomery, daughter & grandson. 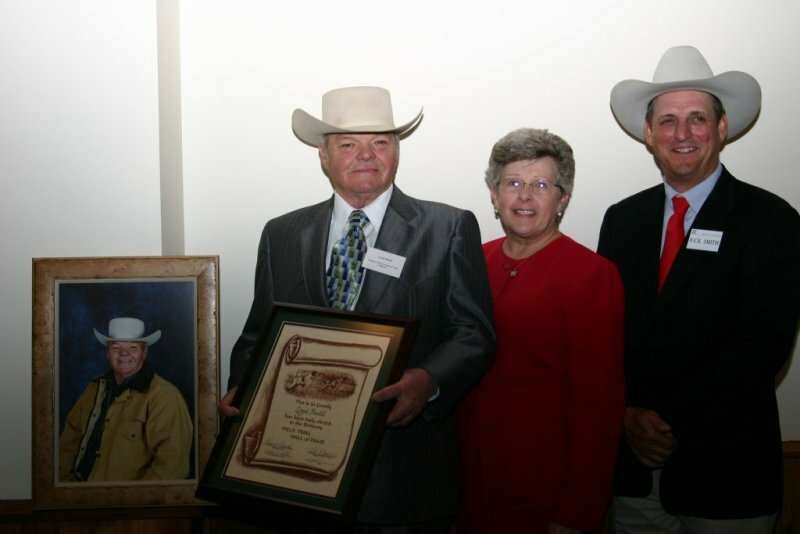 L to R: Bobby Youngs, wife Barb Youngs & Ross Young. 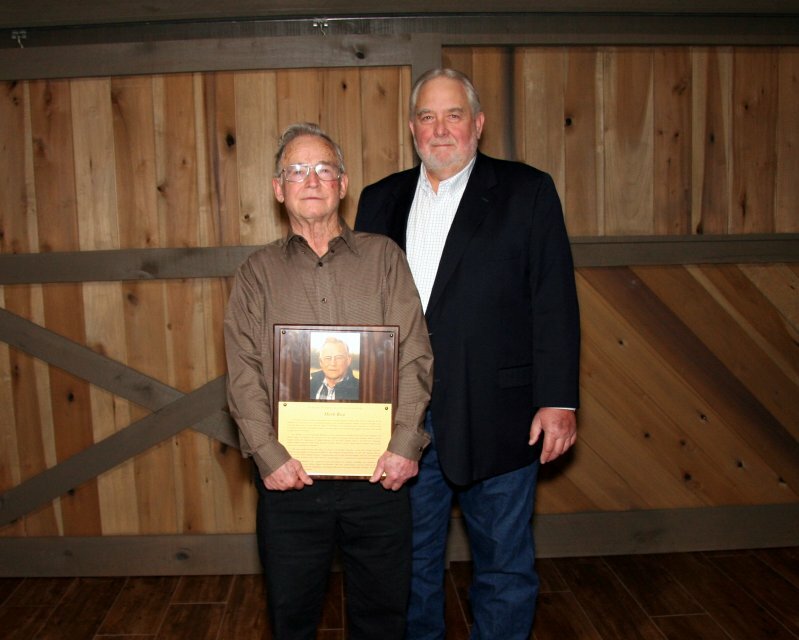 L to R: Dave Fletcher & Tom Tiedeman. 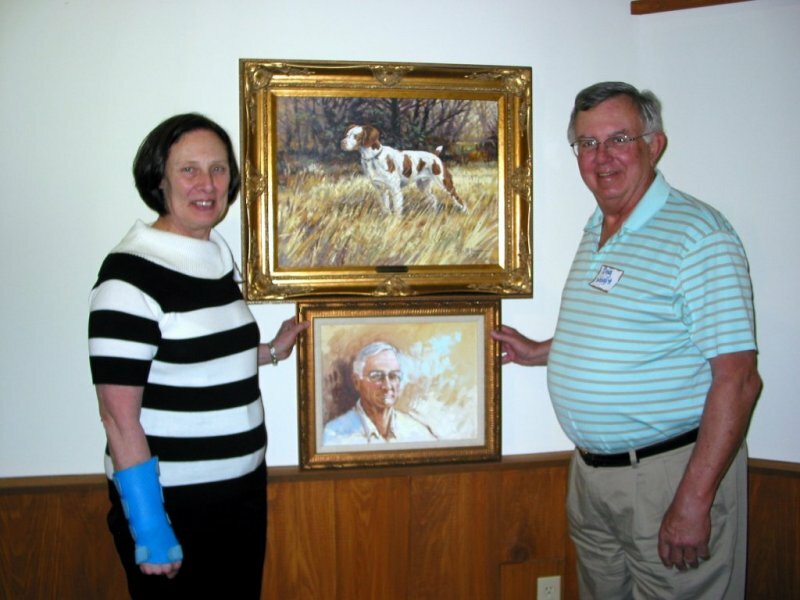 L to R: Dr. Robert Rankin & wife Vicki. 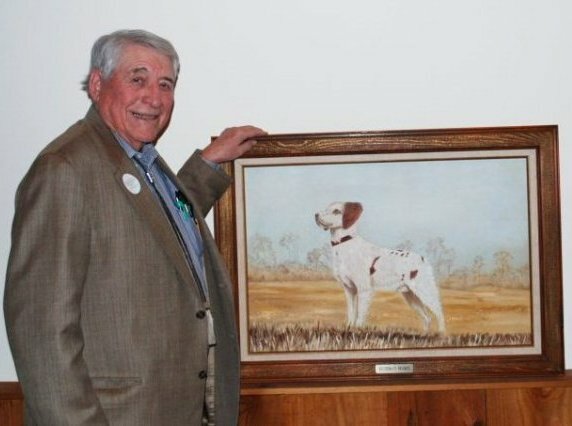 L to R: Delmar Smith, Trainer & Handler for Bazooka’s Brandy. 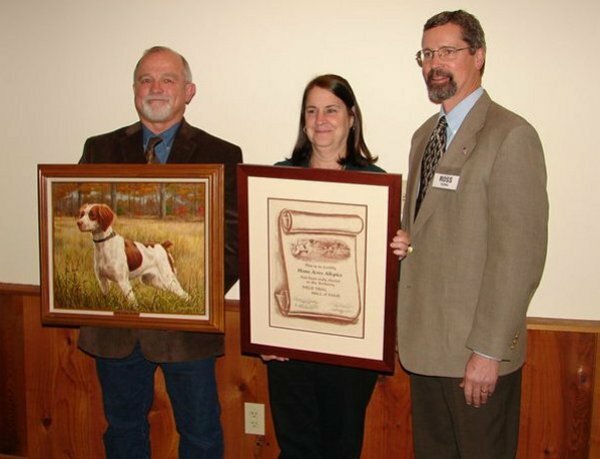 L to R: Rick Smith, Delmar Smith & Karen Quackenbush with Inductee Bazooka’s Brandy Hall of Fame Scroll. 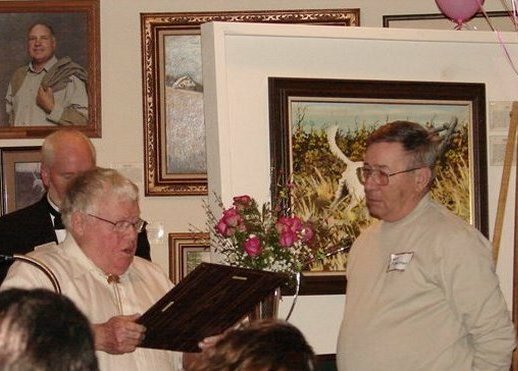 L to R: Janet & Jim Chase. 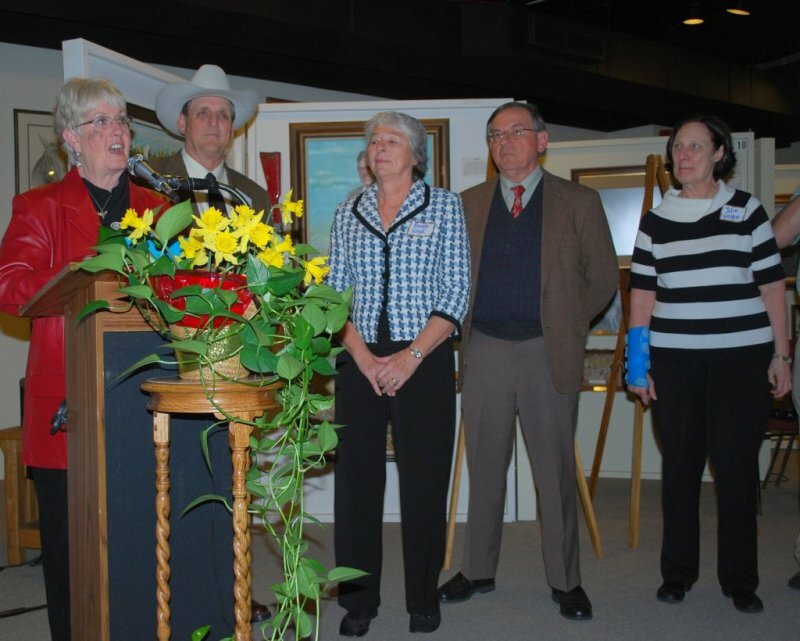 L to R: Mary Crawford, Clem Little, Marilynne Little & Rick Smith. 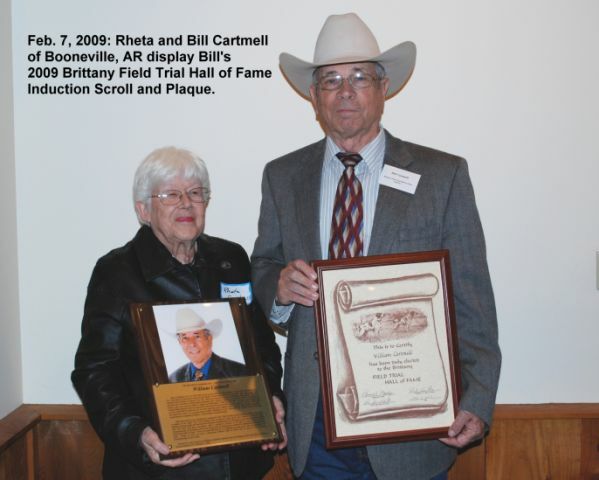 L to R: Rheta Cartmell, Bill Cartmell. 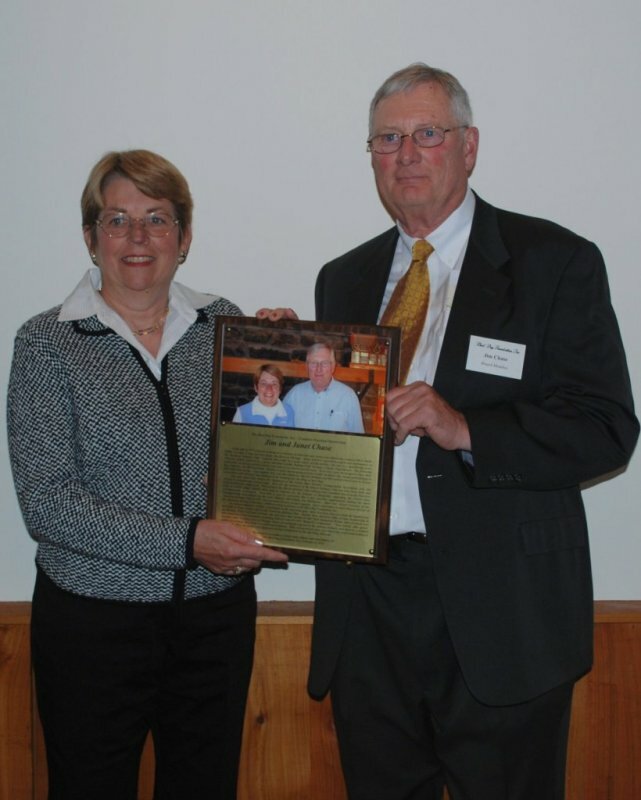 L to R: Judy & John Marinelli. 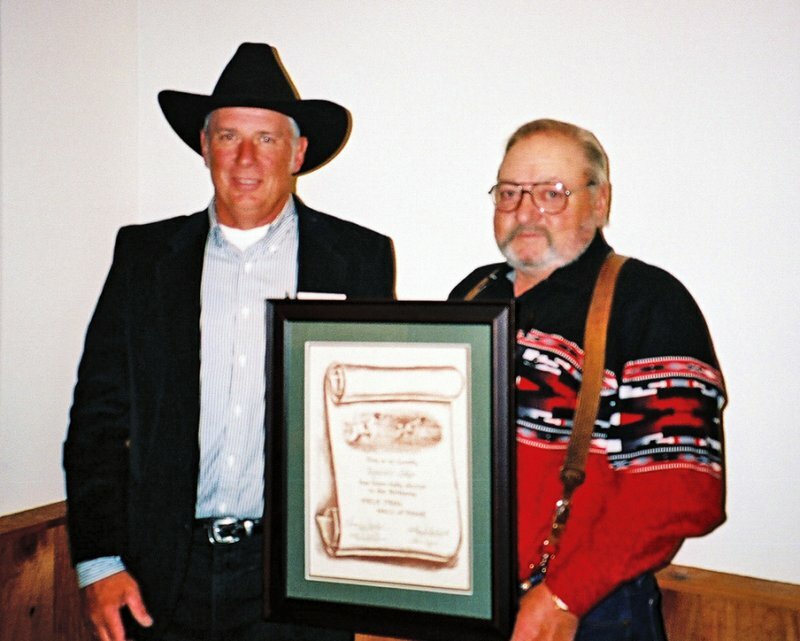 L to R: Ed Tillson & Wade Worrell. 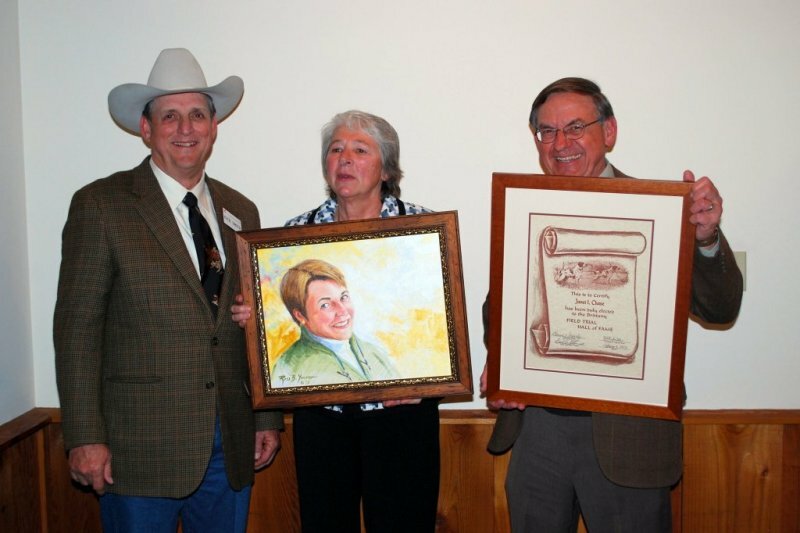 L to R: Janet Chase, Jim Chase & Tom Burroughs. 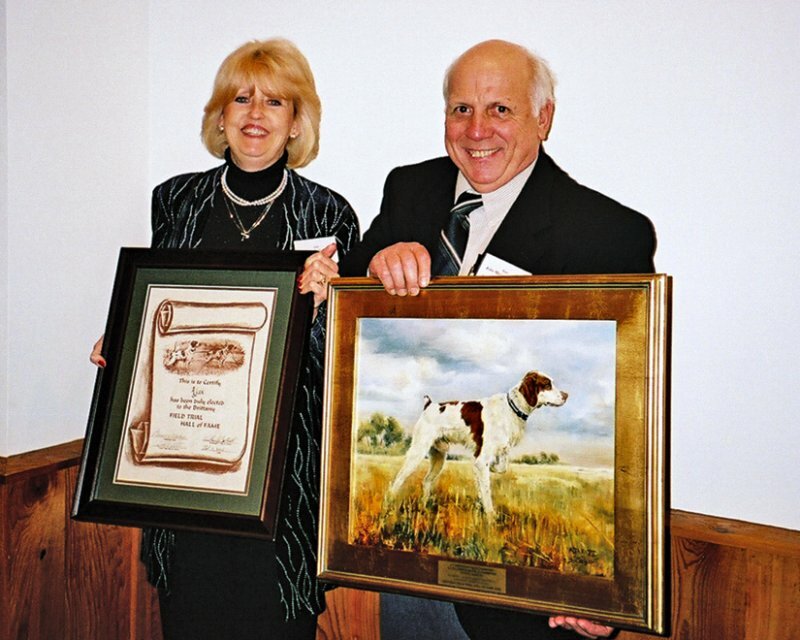 L to R: Rosco & Janet Staton. 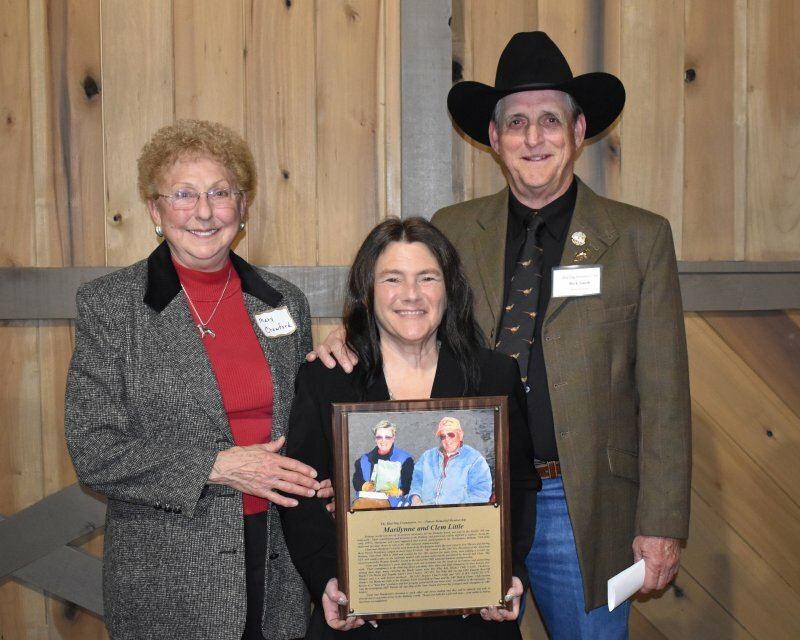 L to R: Loyd Budd, Mary Karbiner & Rick Smith.